Do you have a camera? One of these nice little digital numbers? As a traveler, a globetrotter, or an expat, you most likely take photos of the foreign places where you live or visit. It’s all so different, beautiful, weird, amazing. Then you go on home leave to your own country and you visit with family and friends and you go shopping for underwear and you watch dumb local stuff on TV and you never take a single picture. Because, well, it’s the place you are familiar with, the place you visit often. There’s nothing particularly exciting about it except it is home and it feels good to be there. It’s early Monday morning and my man and I are taking a walk around town. It’s quiet because most of the shops don’t open until 1:00 in the afternoon. This is to make up for being open part of Saturday. How else are you going to have two days off in the week? Sundays most commercial establishments are closed as well. I see a lovely old building and take a picture. I’ve walked by here countless times, but never actually noticed it. As I am taking various shots from different angles, a woman walks by. Stops. Points at the building. “Oh, how nice!” I say, pleased to have her tell me this. She smiles and walks on, away from the building. Maybe she’s out running an errand. We stroll around a corner and come upon the old jail, anno 1841. It’s not much of a building architecturally speaking. I’m studying it through the lens of my camera. An old man on his bike comes pedaling along. Stops, get off his bike, watches me. He points behind me. I’m not sure what to do with this information. Last I heard, being a communist in Holland was not a major news item. For years there was even a Communist Party (one of a dozen or so political parties), but it died a natural death because of lack of voter interest. Democracy works that way. I laugh. “Good story,” I say. Grandpa nods with satisfaction, gets back on the saddle and pedals away. He has enlightened the tourist. On we go, with me snapping pictures. And would you believe, another man, also on a bike, also older, stops and starts telling me a story too. Something about the Second World War and the Germans. But I don’t quite get the point of it. What I do get the point of is the fact that in all the years I’ve come here, no one just stops and talks to me out of the blue. My camera is what makes them think I must be a tourist and need edification. A few days later I’m sorting through a rack of T-shirts on the sidewalk outside a nice clothing store. They’re dirt cheap and they clearly want them gone. Grandpa number three is leaning back against the shop window and watches me, probably notices my camera hanging around my neck. I’ve been snapping pictures of the street. “Those are for poor people,” he tells me, indicating the clothes. “They’re for poor people,” he says again, and I realize he’s not joking. He’s a bit . . . confused. Or, as my mother would say in Dutch, hij heeft een steekje los, he’s got a little stitch loose. For two weeks I take my camera along every time I go into town. Somehow I see now what I never saw before: beautiful buildings, canals, streets, bridges, bicycles, people. The photo above was taken at sunset. The bridge is from 1887. The buildings in the background are babies. Notice the sunlight reflected in the windows. I must confess it was my man who pointed this scene out to me. I clicked the camera. Above: The Dutch love to linger on terraces with a beer, a coffee or a glass of wine. It’s one of my favorite things to do where ever I go. Do you think that as a Dutch person it would have ever occurred to me to take a picture of bicycles? It took me years of being an expat to learn to see the fun in a bunch of bikes. Yes, they’re useful, convenient and cheap transportation, and I did know that. Check out this site with photos of the Dutch on bikes, Different Folks, Different Spokes. 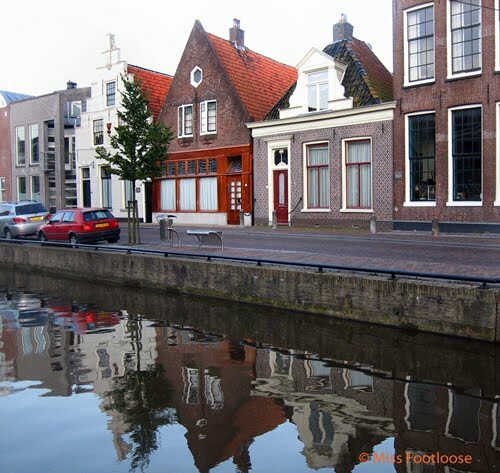 Sneek is a well known watersports center, especially famous for its sailing events. Lakes galore, boats galore. I’m lucky to be here during Sneekweek (unfortunately pronounced Snake wake), a week of big sailing races and partying. The town is full of people who have come here for the festivities. The young ones live on their boats and party half the night. One day I’m shopping with my mother and near the supermarket I see two hunky guys with bare chests pushing a shopping cart along the street away from the store. It’s loaded with nothing but cases of soft drinks and beer, a tower of cases they have to steady with their hands to prevent the lot from crashing to the ground. Another day I’m at the open street market and watch two tall guys strolling along in identical ankle-length blue bathrobes, looking real casual. Bathrobes in the street in the middle of the morning. People are watching, laughing. “Sailors, just off the boat,” somebody says, rolling his eyes. I’m dying to take their picture but my courage fails me. I’m gutless when it comes to photographing people I don’t know. It seems sort of rude to stick a camera in someone’s face, don’t you think? Even if they’re nut cases like these two. I’ll never make it as a papparazza. They laugh and disappear into a store. I decide I’ll wait for them to come out. A few moments later they do, turn back in the other direction and I follow them to their car parked nearby. “Not if you don’t want to.” And I snap. And here’s the result. Looks like they were parking in a handicapped space, shame on them. The Waterpoort has special significance for me. My parents used to hide in the corners when they were young, after the curfew hour imposed by the Germans during the Second World War. Hide and smooch in the dark. My mother still tells me this at times. It gave them a thrill, a dangerous one. You really didn’t want to get caught after curfew. So I stand there in the failing light, snapping away at my parents’ old make-out place, and a couple comes strolling by, walking hand in hand. The man turns around and grins at me. “They’ve got postcards, you know,” he informs me. And so, dear readers, here you have them. What do you think? We are so used to seeing old, familiar surroundings, we often don’t appreciate them. Have you ever come back to your home town and seen it with new eyes? Or through the eyes of someone else — a friend, a child? What were your impressions? What had you been taken for granted? wFancy living in such a fabulous spot and never realising how good it would look through a lens! I guess I’d better take my camera uptown, but I won’t find anything as good as this! That was a fascinating tour! Thanks for taking us along! How fun that you changed the way you look at things. Maybe we all should! The Dutch seems so friendly and I really miss the smiles and nods of strangers here. Great photos! Love the post. I can’t identify quite with your experience as I’ve never lived away but I have had the opportunity to show friends around who had never been here and I took them to places I had never been because they were touristy area. But they were historic and I enjoyed seeing them for the first time! Louise-with-the-highly-creative-child: Glad you like my post! Go ahead, post about your hometown. Louise-in-Italy: Thanks for the compliment! Moody, that’s it! Naw … the picture of Waterpoort is great! Nice and moody! I like it. Linked here from BTOW. Great photos and comments of your travels through your home country. I visited there years ago and loved it! Those a beautiful photos and what a wonderful story about your home town. I think we all need to do that. You always make me feel the place. It reminded me of when I visited Copenhagen, where I was born. I’m always with my best friend though and don’t look around as much as I should as we have so much to catch up on. What I like is the “hygge” cosy atmosphere at the outdoor coffee shops, and the pastries that people still eat with their coffee etc. I don’t have to take many photos, my husband’s always taking them. How funny that everyone assumed that you were a tourist. I enjoyed your shots, you’re really good! This was such a lovely visit!!! I am not sure I have a hometown. I am afraid I have moved so much, beginning in my early childhood, I often feel rootless. However, I have lived in many great places! What a fantastic idea! I’m going to do it also one of these days. I love you photo of the surly man. Just visiting Stil enjoy reading post and I can so relate to this one. I never made photos of my hometown/country but when in Holland I made lots also fotos form bikes and mills which I never would have done before. Lovely photos. And how hilarious that people kept coming up to you to talk! 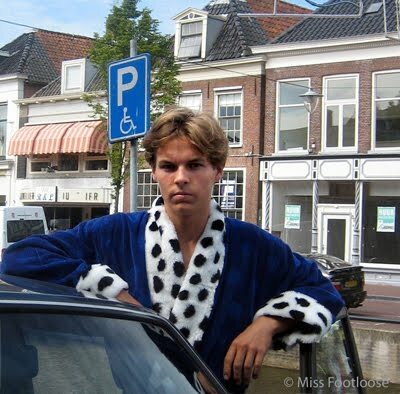 That photo of the grumpy bathrobe-clad young man is hilarious! Since I joined the meme Show your world, I take photos of my surroundings for these posts. It’s a wonderful way of recording all those details you might have missed otherwise.